KLM & Heineken surprise 4 lucky people with the ultimate Orange Experience. 4 lucky people who share the same birthday as the Dutch King were invited by their friend/loved one to celebrate their birthday in a most unique way, each were allowed to come with the person inviting them. The airline joined forces with Heineken for the third year to reveal one of Holland’s best kept secrets, the epic celebration of the birthday of the King on the 27th of April. The two Dutch icons visited four cities around the globe - Beijing, Rio, San Francisco and London to surprise the lucky winners, who would be treated to VIP access to the biggest event in Holland. The contestants were immediately whisked away to an airport, stopping just to pick up a bag. It was only then they were told of their destination - Amsterdam! The Dutch capital is famous for being an awesome tourist destination, but King’s Day offers a whole host of new activities to travellers. The city lights up with a series of music festivals, club nights and street markets, but these lucky few were in for something special. The winners arrived in Amsterdam with King’s Day celebrations in full swing. They were first taken to Soestdijk for a Royal Experience, after which they proceeded to Amsterdam to play typical Dutch King’s Days games before boarding a boat for a Royal Birthday party. After the boat ride they were taken to The A’dam tower for a party of their lifetime, awaiting them there was none other than world famous DJ Martin Garrix. With its combination of world class culture, entertainment and history, Amsterdam is an absolute must for travellers everywhere. 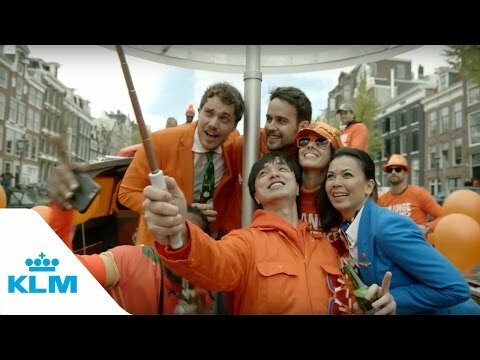 And, as KLM and Heineken proved, there’s no better time to visit than King’s Day.